Add an eye-catching, elegant border to your landscaping with the Esschert Design Open Scrollwork Garden Fence. Using low fencing around your garden or walkway keeps your favorite plants protected from foot traffic, and the classic design elements on these units enhance any setting with traditional style. 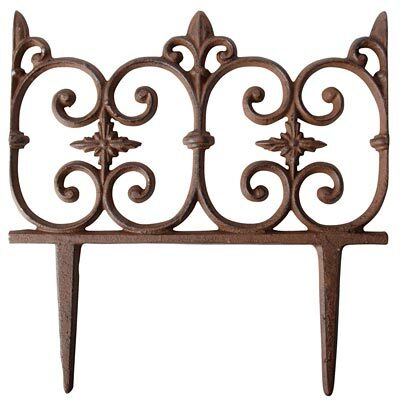 Each 10.5" wide, cast iron section sports four vertical scrolls, with starburst shapes connecting the curls and a fleur-de-lis center topper. The brown tone of each unit perfectly complements your landscaping, while two, 4" long legs insert easily into your soil. Black accents throughout each cast iron piece further the aged feel, and will certainly withstand use for many seasons. Make your garden path a focal point in your yard by lining it with the Open Scrollwork Garden Fence pieces. Note: This case pack includes 12 of the Esschert Design Open Scrollwork Garden Fence sections.